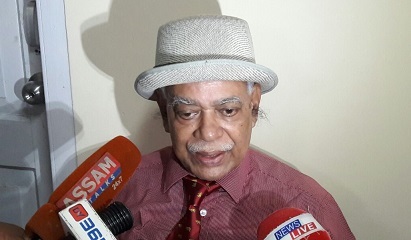 Retired Chief Justice Gauhati High Court, HN Sharma, conducted a hearing in the cases of the victims of electrocution from Kokrajhar, Chirang and Dhubri districts on Tuesday, in Kokrajhar district. The hearing was also attended by Assam Power Distribution Company Limited (APDCL) officials including Mukul Patowari, CEO, Bijoya Bora, AGM, Bhaskar Das, SDE and Biplab Sharma, AGM (T & C). The hearing was on the electrocution cases which took place in different parts of Kokrajhar, Chirang and Dhubri districts. At least four victim families attended the hearing. The hearing was conducted at the Circuit House in Kokrajhar. The victims’ family members appeared before the chairman of the One-Man Inquiry Commission, Justice (retired) HN Sarma, during the hearing and submitted all details about the electrocution cases occurred in various places in Kokrajhar, Chirang and Dhubri districts. The electrocution cases took place since April, 2017 till date. Justice (retired) Sarma paid attention to the victims’ families during the hearing in the presence of the APDCL officials. Sarma said the State Government formed the hearing committee to take stock of the electrocution cases that have taken place across the State. The family members of another victim, Ikramul Mondol from Kokrajhar district and the family members of victim Johura Bibi also gave similar statement.